i had serious envy when i read this post about mothers’ circles in rhythm of the home a while back. it is a nice read and was ultimately very inspiring once i got past the envy… getting past the envy involved realizing that probably every mama who read that article, felt the same way as me, if they didn’t already have something like that in their lives. 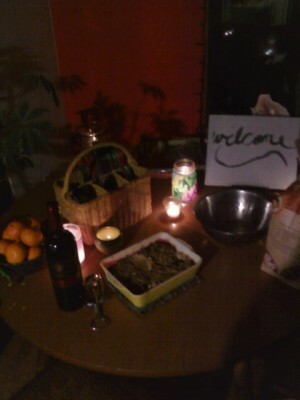 on wednesday night, i took a stab at hosting some of my local mama friends at my place. i don’t know whether i would call it a mothers’ circle or not, but the four of us present were all mothers. i certainly don’t feel like any kind of spiritual leader (ack!) so there wasn’t a lot of ceremony involved, and i headlined it as a “crafting night” with the crafting optional and let it all kind of unfold however it would. all i really did was create some space for it (cleaned my house and baked a treat), and give it a spark (sent out an invite) and… unfold, it did! i don’t know why i was nervous. don’t women, especially mamas, always know how to get past the differences and find the common ground? and don’t we all yearn for community? shortly into the evening, there was uterus discussion. birth, death, midwives, herbs, change, aging, moving, growth, pregnancy, on and on. we talked homesteading topics (chickens, goats, bees, you name it!) and of course, about our kids. 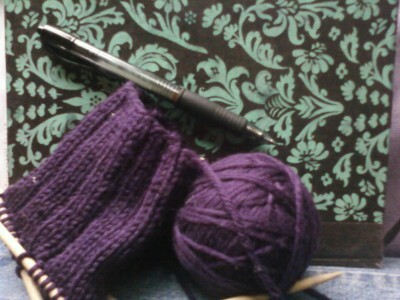 i knit about three rows on my sock, in keeping with the ostensible theme. not nearly as productive as my friend who made a batch of coconut butter soap right there in my kitchen! it was so. very. nice. i want to do it again! i am always one to wish i had a tribal community, where all the women are essentially family they are so close, and there is always support- emotional and physical- within reach. a little network of real live nearby people. i am thinking this small step (which for whatever reason, took so much courage) is the first step from wishing toward manifesting. isn't it funny how something so seemingly small can feel so HUGE and daunting?but then you do it and wonder why you waited or feared!so glad for you…one small step toward tribe! *Sigh* I so wish I had something like this where I live. It seems that all my like-minded, kindred-spirit, mama friends are online. I have really only one friend here in town that I could talk to about anything…but even still, we differ greatly when it comes to schooling and parenting our children. mamaste~love it! envy for sure! Thanks for sharing mb!